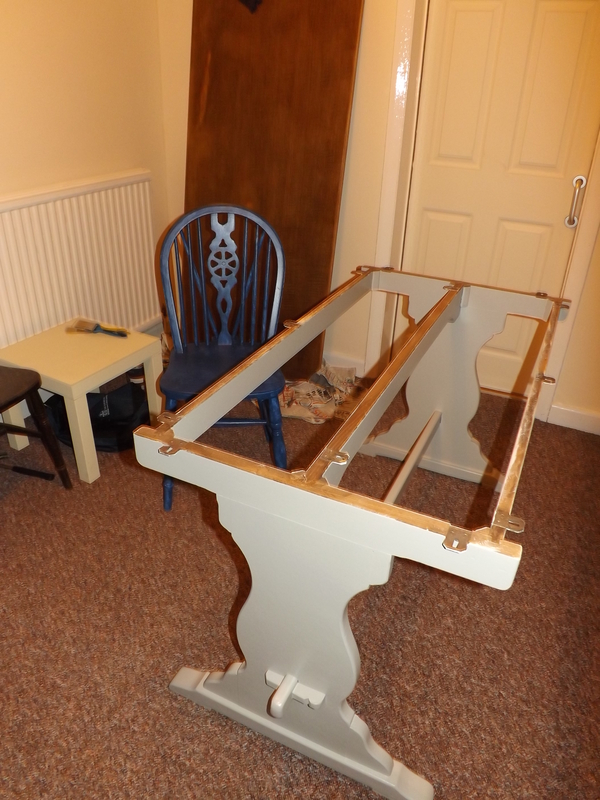 Dining table and chairs – 9 days on! We started the table and chairs project a little over a week ago when we had a few days off work. By the end of the weekend we’d got the base finished with two coats of primer and THREE of topcoat to get a nice finish. Painstaking but worth it as it looks lovely. I still think I might wax over the top to help protect it but this will have to wait for now. I got the first chair primed and the first coat of colour on. And finally R got a coat of varnish on the table top. The base is painted in Lamp Room Grey by Farrow and Ball which is just a beautiful colour. I still have over half a tin left so I’m sure it won’t be long until I find something else to use it on. Perhaps the new desk I picked up yesterday? Anyway since going back to work I have to report that progress has been agonisingly slow unfortunately! The first couple of days met with traffic disasters and so it was dark when I got home so not the best time to paint. Combine this with a little socialising, other things that needed doing, working this weekend and just life in general I’ve not got much done. And now the clocks have gone back, which is not going to help either! 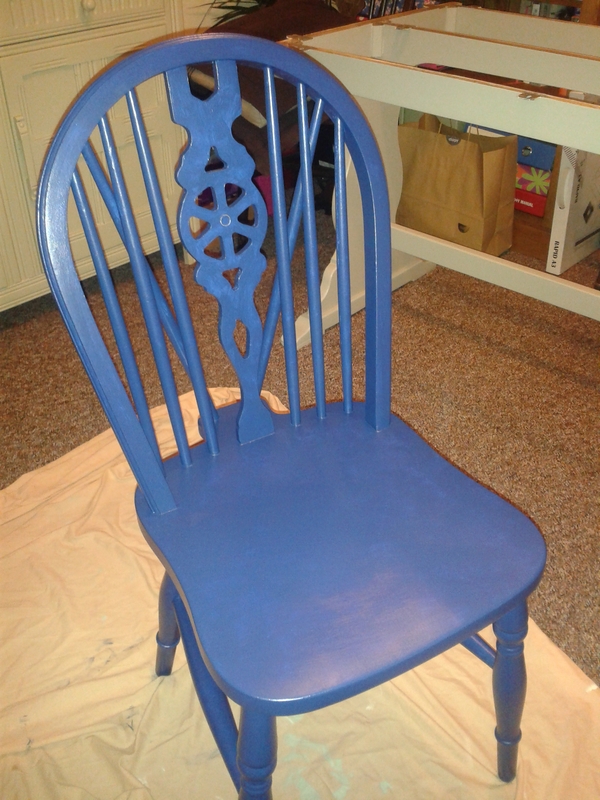 The second coat of blue’s gone on the chair though and it looks so much better. I think it still needs another coat though! The colour looks darker in the daylight without the flash (and much more sophisticated I like to think!). It was meant to be Drawing Roon Blue by Farrow and Ball but we couldn’t get hold of any without ordering it and just wanted to get on with it so we had the best match possible made up in Dulux eggshell instead. We got more paint for less money and the colour is a pretty good match to be fair! In the end I’ve come to the conclusion that this project is going to take a long time to complete! I know it’s going to be worth it though in the end and I’m enjoying the process. Most of the time! The chairs are hard work though – I’m definitely going to do them one at a time! When it’s finished I’ll have to make some new covers for the chair cushions. Any ideas what colour I should choose? If you’re enjoying reading about my furniture transformation you could follow my blog so you won’t miss my next update! If you’re working on any upcycling projects, I’d love to hear about it, and I hope you’re enjoying it! Posted on October 28, 2013 October 28, 2013 Categories DIY, UpcyclingTags Eggshell, Furniture, painted furniture, renovation, table and chairs, upcycle, upcyclingLeave a comment on Dining table and chairs – 9 days on! Haven’t got so much done today as each step takes ages. Also there’s drying time to consider. 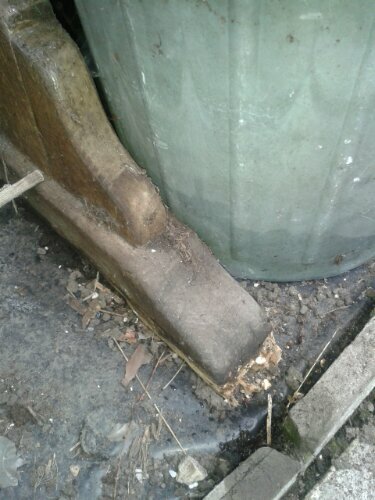 Firstly I used wood filler around the new feet to tidy them up a little, which has to dry before you can sand it. 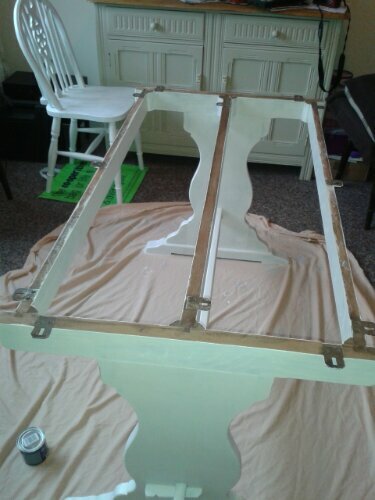 I then added a second coat of primer to the first chair and have managed to do two coats on the table base. Not bad progress I guess! Can’t wait to get it finished but it’s going to take a while! 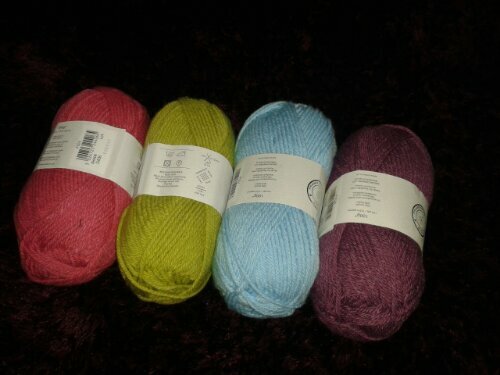 In other news, my order arrived for some wool to make a baby blanket for a friend – very exciting! My favourite yarn supplier at the moment is Love Knitting for their great range of yarn and very quick delivery! We have a birthday celebration to attend tonight so won’t get anything else done today but I hope we can get some more done tomorrow. 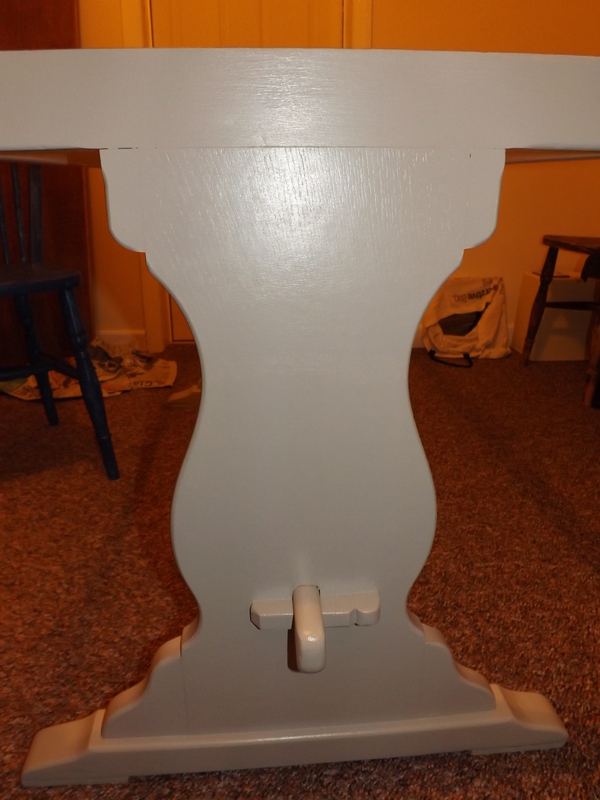 Dining table and chairs upcycle – day 1! 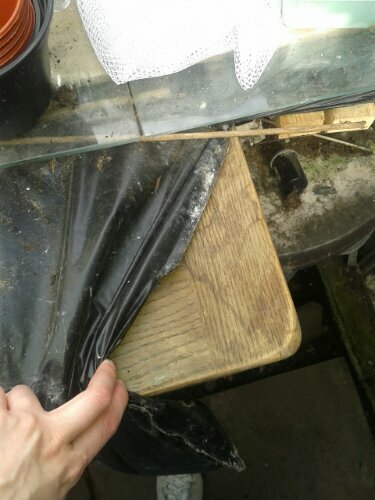 So my boyfriend and I have a few days off work and have decided to start working on our dining table and chairs. To set the scene, when we moved house we were looking for a farmhouse style dining table and chairs on ebay and were getting ready to spend a fair bit on it, which we shouldn’t really be doing as we need to save a deposit for a place of our own. It turns out my dad had one that we could have for nothing but the cost of getting it couriered to ours. 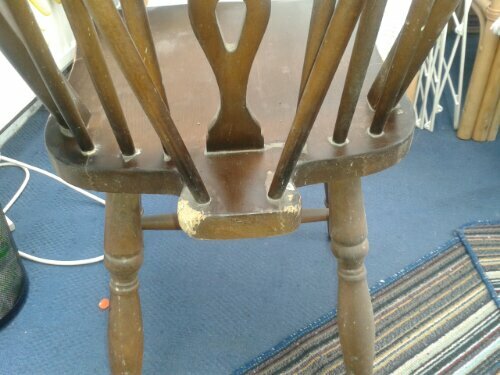 There were two matching chairs and I knew I could find more on ebay to make a set of 6. “What’s the catch” I hear you cry? 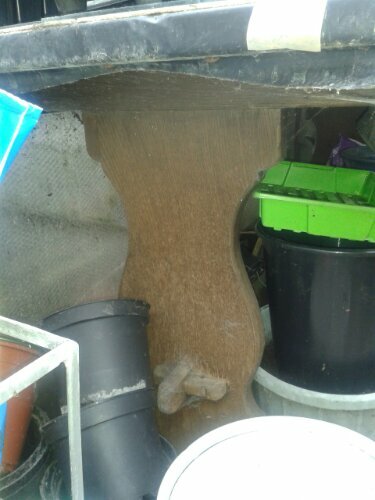 Well, dad had been given it by a neighbour who was going to throw it in a skip. That was 10 years ago and dad has been using it for potting plants on in his greenhouse ever since! 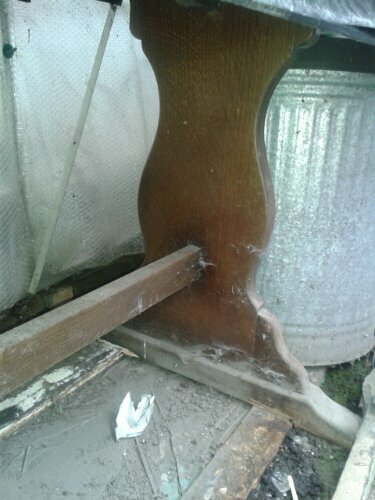 To make matters worse, the family’s dog had been rather fond of chewing on the table and chairs! As you can imagine it was in a bit of a state, but not irreparable and ultimately almost free. We gave it a good clean and transported it to our house. I bought 4 matching chairs cheaply and I got a pink spotty pvc cloth to cover the table with. It has been serving us very well for a few months now. 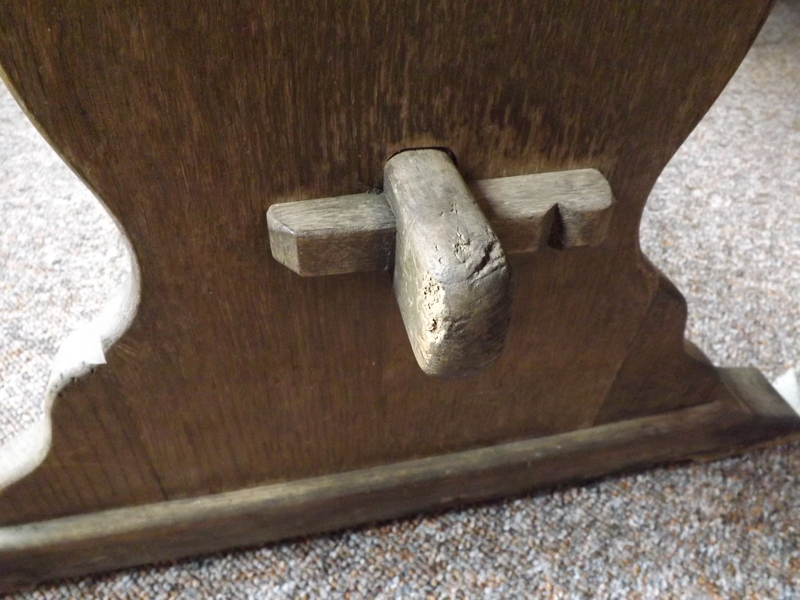 And this is an example of the dog damage on one of the chairs. We’ve now decided it’s time to tackle the makeover! A very lovely friend of mine has lent us her two electric sanders and we’ve collected together lots of sand paper, wood filler, primer and our paint colours – more about those on a future instalment! Today has been seriously hard work. This project is going to be a real labour of love! Still, I think we’ve made great progress. The base is fully sanded and the holes are filled. My long-suffering other half chipped off the old rotten feet and fashioned some new ones and now it’s ready for the primer. 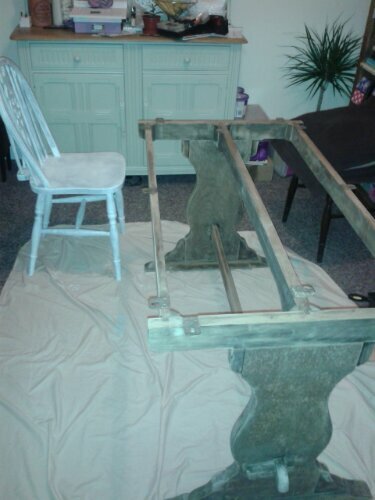 We also managed to get two chairs sanded and one primed (what a job that was) and we’ve started sanding the table top – more on that another time. A very exhausting but satisfying day. 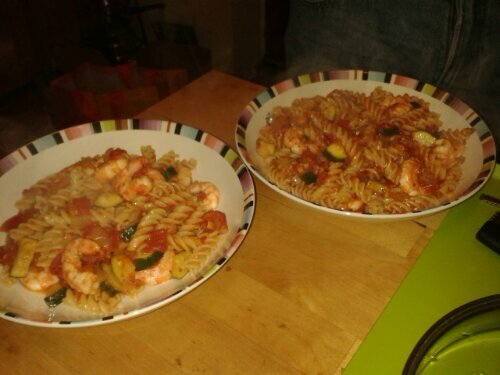 Now for a massive bowl of prawn and courgette pasta to celebrate! Posted on October 17, 2013 October 17, 2013 Categories UpcyclingTags Furniture, painted furniture, renovation, table and chairs, upcycle, upcycling2 Comments on Dining table and chairs upcycle – day 1!